My baby girl turned FIVE a few weeks ago and I figured, age five was the perfect age to throw her first, big party. I mean, five is a pretty important age. Some of my very first memories are between age 4 - 5, and I wanted this day to be special - a day that will hopefully be one of her first memories when she's old like me. Because she's five, she lives in a world of wonder and fantasy. Her favorite things to do include pretending she's a princess, pretending she's a pony, putting on fashion shows, coloring in princess coloring books, and watching pony and princess movies. Her latest obsession = My Little Pony. And she insisted on having a My Little Pony birthday party. Now, I'm all for themed birthday parties, but I didn't want her party to be a cartoon explosion. I wanted to keep it classy, but still kid friendly. 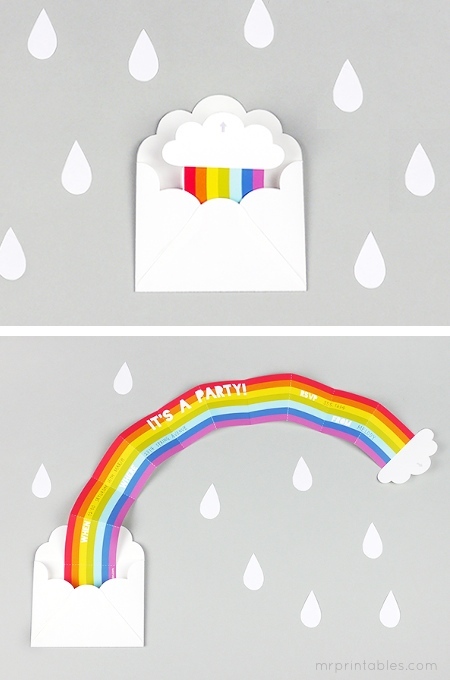 images via MrPrintables.com You can download the invitation HERE. Before the party, I asked each of the moms about their daughter's favorite thing to do. 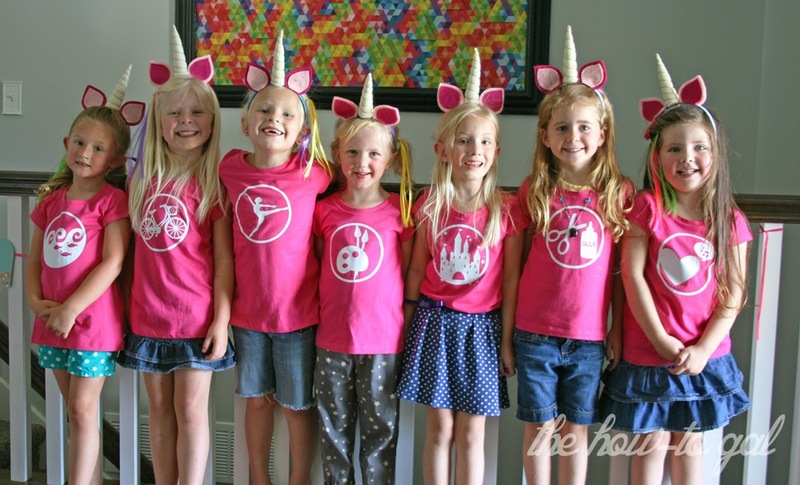 Then, with my Cricut I made custom "cutie mark" t-shirts the girls wore at the party. Each of the girls loved different things, so all of the shirts were different. They turned out so cute! 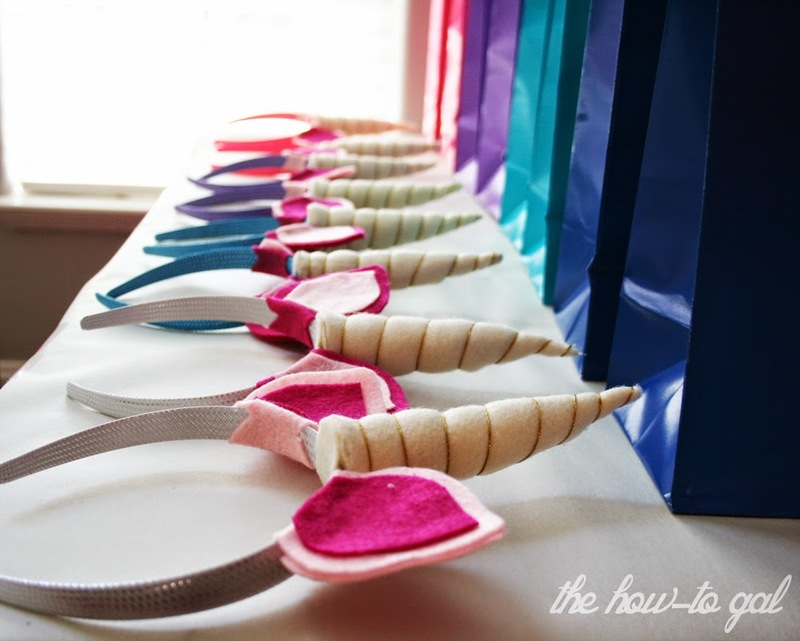 Unicorn horn headbands! I couldn't help myself. 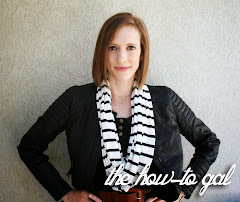 I made one for each of the girls and will be sharing a tutorial later this week. 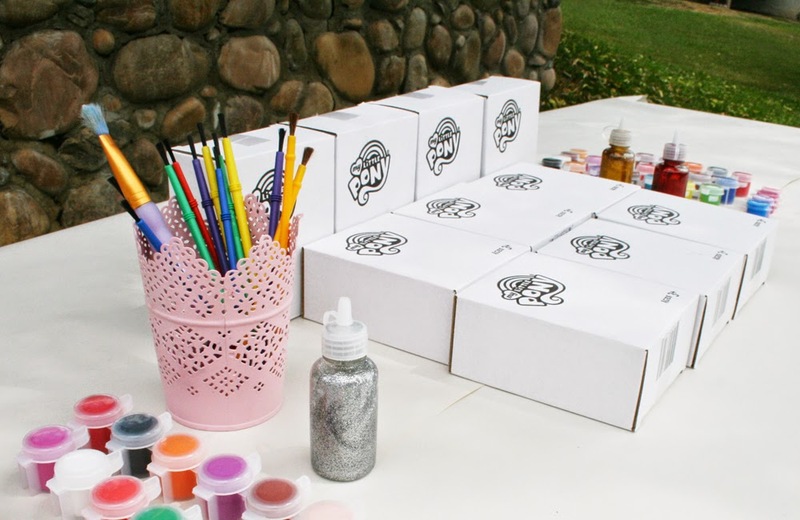 I filled the swag bags with a My Little Pony coloring book, pens and a puzzle. I made sure the bag was big enough to carry their shirt, unicorn horn and painted pony. Yes, I said painted pony. Did you know you can buy blank My Little Ponies on Hasbro's website? Well, you can. I bought one for each girl to paint at the party. I put the table outside to avoid the inevitable mess :) The girls LOVED painting their horses. 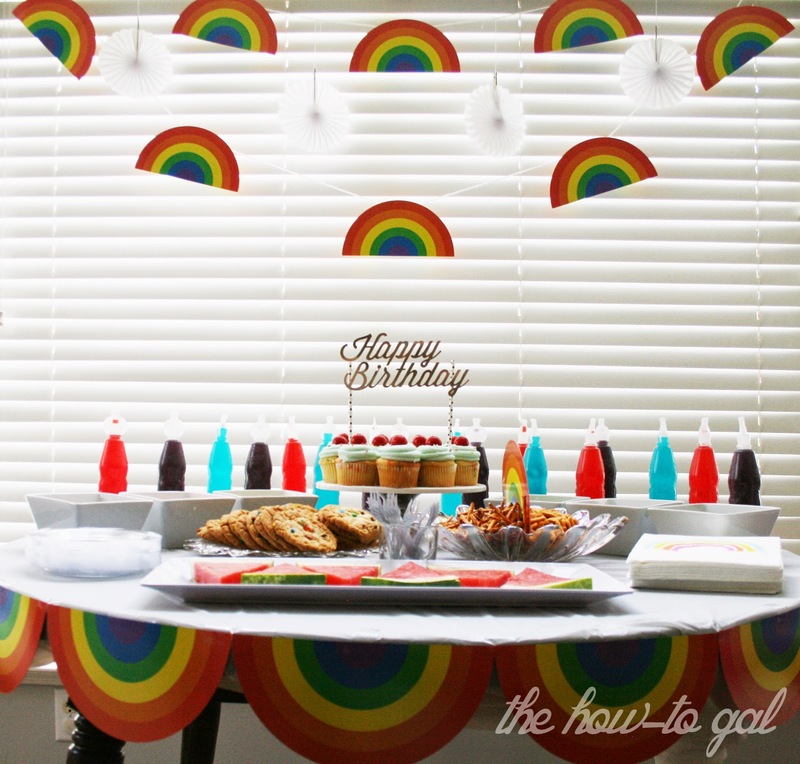 For the food table, I incorporated the rainbow theme from the invitation into the decor. I made the banner from items I found at Zurchers. 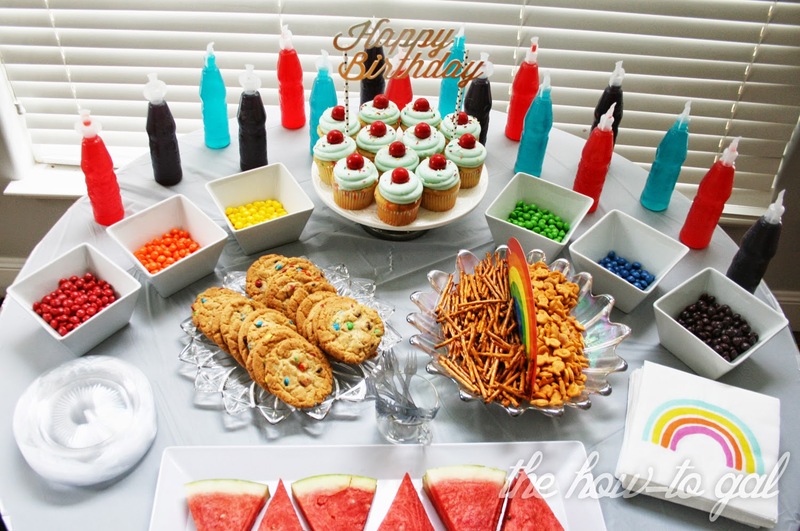 Skittles, squeeze-its and cookies, oh my! I wanted to make everything look bright and happy - it wasn't until later that I realized that I gave the girls a SUGAR OVERLOAD. Sorry parents! Instead of a traditional cake, E chose cupcakes. For the Happy Birthday topper, I used TomKat's design from Cricut Design Space. I cut out 10 Happy Birthday images with my Cricut and then glued them together. The top layer is a shiny piece of gold paper. The party was more work that I bargained for, but I am happy with how things turned out. I'd even say it was a success. After all, the birthday girl did say, "This party is everything I've ever imagined." Thanks Sarah :) I heard your little girl loves MLP too!!! Will you be MY mommy and throw me a party??? This is just Too Cute! I be she loved it. 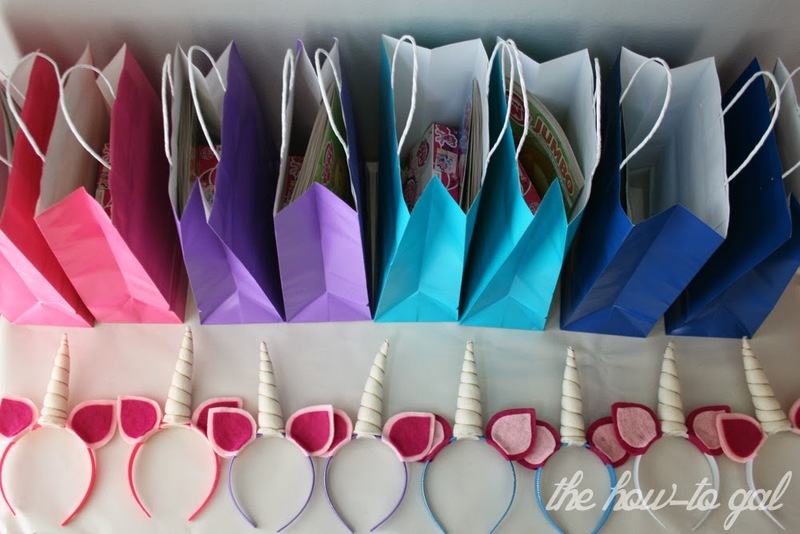 Those Unicorn horns... yeah, going to need to make one. 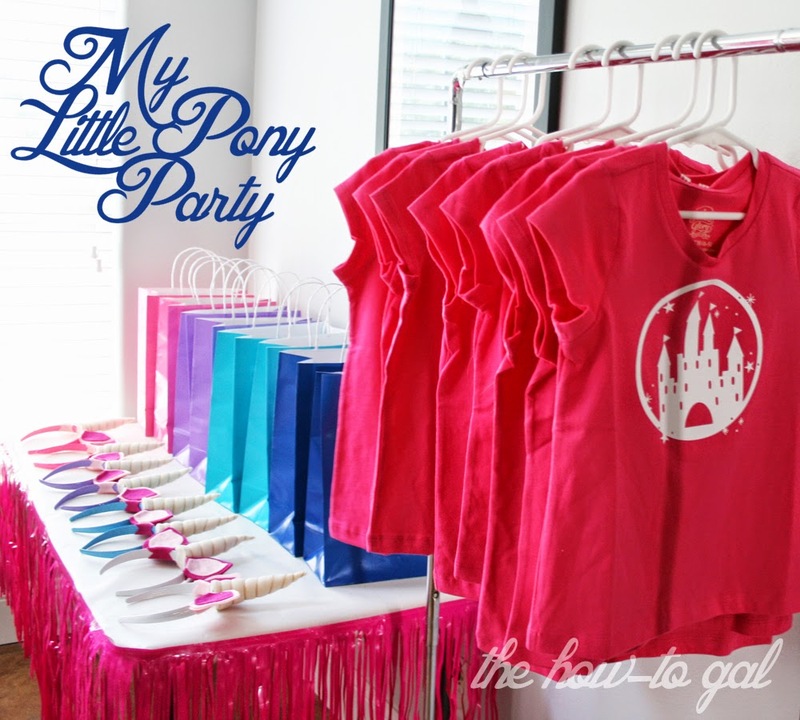 Love the personalized t-shirts and unicorn headbands! 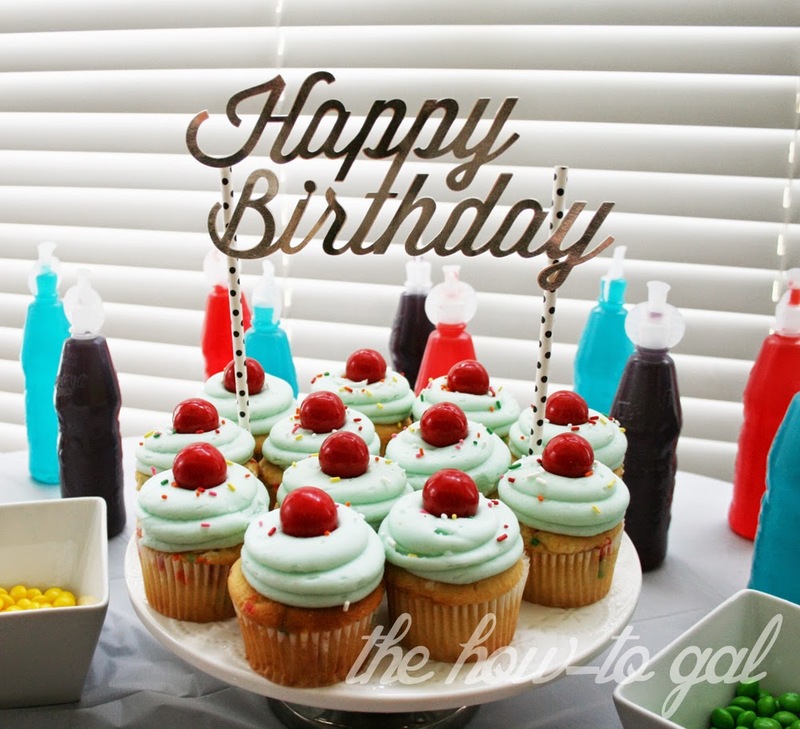 Such a cute birthday themed party. Way to go!! Awesome job! I wish I was as creative as you! Sevina, you totally are! I remember that Pascal pinata you made for Clara's birthday!! Your the best mom ever! I loved the shirts with all the different interests on them, so cute. I am sure she will remember this party forever. I love how you made an individual shirt for each of the girls - they must have all had a blast!